My fondness for sesame seed/ellu all started when tasting ellu urandai/ladoo Each bite with crunch and nuttiness that one can never stop with having just one.The temple term for this sesame seed rice /ellu podi sadam is “Ellorai” served as prasadam at most of lord perumal temple’s.I have never made this one before in my lifetime.But it was just a try to make a different kind of variety rice from the usual.One of our family well-wisher had framed a cookbook from his own collections.Have printed only limited copies and particularly not for sale.He had compiled it for his own record and interest in cooking. From this book I have tried few of his recipes and it has turned out perfectly good.Now this sesame seed rice /ellu podi sadam too was a try from his book and followed his way of making.It turned out to be a different kind of variety rice with nuttiness from dals and seeds filled with flavours.Instead of black sesame seeds you can use white!I have used this black variety because it has more nutritional strength and taste than the white ones.You can simply roast sesame and chillies alone and grind it.The other items like mustard and dals can be seasoned and added as such to rice.In this you can keep the powdered ellu for longer days and make this rice whenever needed. 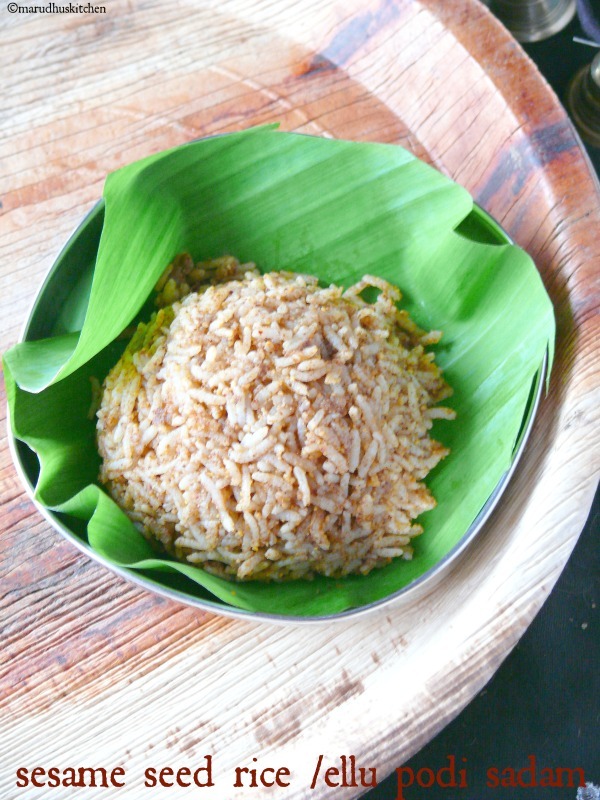 1.First cook rice add Gingelly oil to it and spread in a wide vessel and set aside. 2.Dry roast Sesame seeds and when it splutters take out and keep separately. 3.In the same pan add oil,mustard,bengal and urad dal with chillies. 4.When mustard splutters and dals change colour switch off and add hing to it. 5.Now grind dal items with sesame seeds and grind to a powder. 6.While grinding itself add salt needed for rice and grind. 7.Add the required amount of ellu podi to rice and mix thoroughly and serve. First cook rice add Gingelly oil to it and spread in a wide vessel and set aside. Dry roast Sesame seeds and when it splutters take out and keep separately. In the same pan add oil,mustard,bengal and urad dal with chillies. When mustard splutters and dals change colour switch off and add hing to it. Now grind tempered dal items with sesame seeds and grind to a powder. While grinding itself add salt needed for rice and grind. Add the required amount of ellu podi to rice and mix thoroughly and serve. Its not needed that powder should be fine it can be little course. While mixing rice always add Gingelly oil for more flavour. You can use black ellu too instead of white. You can try it with Samai,varagu or any other millet. 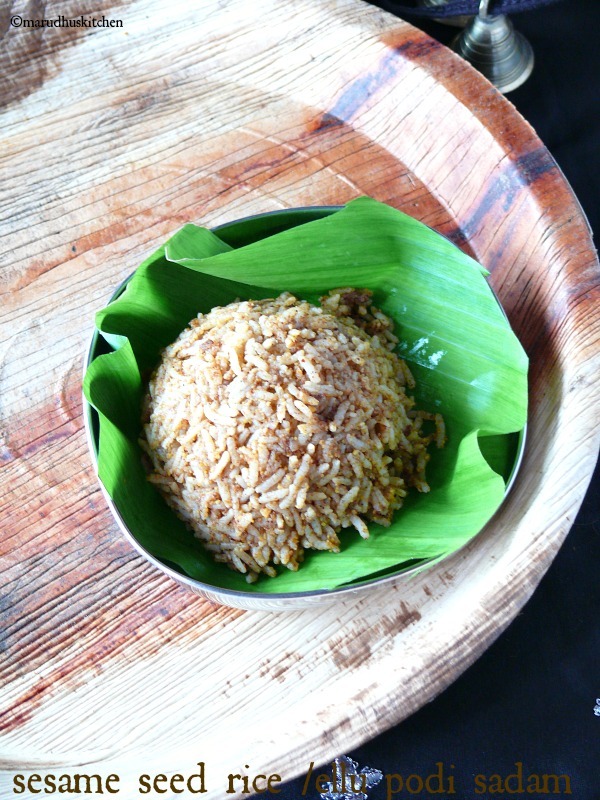 Healthy and flavourful rice!! Yumm!! Sesame seed rice looks and sounds awesome, Vani.